In lieu of my regular Saturday street style post this week I am going to write about the iconic street style photographer: Bill Cunningham. Bill Cunningham provides pictures for two sections of the New York Times Sunday Styles section, On the Street and Evening Hours. The On the street piece is my favorite part of the Sunday Styles section. As part of my research for this post I re-watched Bill Cunningham’s biography released in 2010. This movie is a profile of this New York City fashion photographer. This biography follows Bill around New York City and Paris as he takes pictures of people on street, at fashion shows, and at events. If you are a fan of fashion and Bill Cunningham you should watch this biography available on Netflix. You will recognize some of the people interviewed for this film such as Anna Wintour and Iris Apfel and you will be introduced to new people he has photographed several times as well as his coworkers and neighbors. During the filming of this biography Bill lived in Carnegie Hall along with a few more tenants but they were being evicted within that year. He basically lived in a room with tons of file cabinets and a mattress. The bathroom was in the hall and there was no kitchen but he was happy. Bill can be spotted on the streets of New York City always wearing his blue jacket and riding his bike. He purchased the jacket in France because it was inexpensive and had several pockets for his camera and equipment. This coat was sold for the street cleaners in Paris. During the film he was riding around on his 29th bike, 28 of his previous bikes were stolen. He “documents what I see”, photographing life. His On the Street pieces usually have a theme or trend he has spotted on the streets. He writes a clever narrative to go with the pictures describing the theme or trend. He has covered the preppy Ralph Lauren look of the eighties, the baggy pant look, and he even put together a piece about fanny packs. For the Evening Hours section of the New York Times Bill attends parties and events but this section is not meant to be a society column. He selects the events he will photograph based on the charities involved rather than based on who will be attending these events. He said name dropping will not get him to attend an event. He doesn’t eat or drink at these events, not even a glass of water. He said he is there to report and to be objective. He will go to multiple events in one night traveling on his bike. 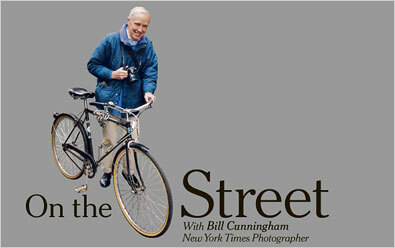 Bill Cunningham is an inspiration to me. I look forward to his posts every week. He loves fashion and spotting unique looks. He loves what he does, has fun everyday and doesn’t consider it work.